This TA Technix sport suspension kit is for the Mercedes Benz E-Class Sedan W124 from 1985-1995. 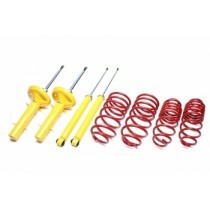 This TA Technix sport suspension kit is for the Mercedes Benz E-Class Station Wagon type W124T from 1985-1995. This TA Technix sport suspension kit os for the Mercedes Benz E-Class type A124/W124 from 1991-1995.